Many intensely biodiverse tropical rainforests are not only inhabited by wonderful wildlife but also by people who call it their home. In these areas, farms offer opportunity to grow crops or maintain livestock in order to provide income for their families. In an ideal world, these two landscapes would be separated and conflicts would not exist. 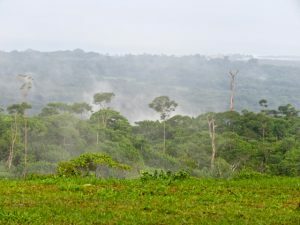 However, located where the rainforest meets farm, there is a matrix where the flora and fauna interact and where human-wildlife conflicts can occur. 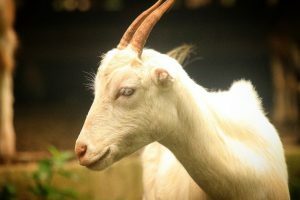 In the Osa, we witnessed first-hand this fascinating matrix between farm and wildlife when we recently heard that a goat had been killed by a predator on our farm. Interestingly though, when we arrived at the farm we found that not only one goat had been killed but two! But by what? To investigate this, we set up a camera trap near each goat, hoping the predator would return to collect their kill. As day turned to night, we used the lights on our phones to check the final camera and navigate through the field back to the car. As we were approaching the car, we looked up and found two big beady eyes shining at us – IT WAS A PUMA! This was my very first sighting of a puma and we were only a couple of meters away! Laying down, the puma observed us as we observed him while we walked past. We quickly hopped into the truck as he got up and headed towards the goat. We watched as the puma approached the goat and dragged away the carcass to enjoy the dinner alone. What a very exciting experience for us to watch! Yet, this young male puma wasn’t the only visitors to the goats. 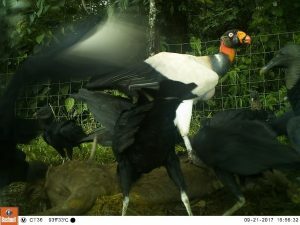 Through our camera traps, we were able to observe a common opossum, yellow headed caracara, black vulture and the magnificent king vulture – all feasting on these recently killed meals. Observing this very real and natural event brought mixed emotions. While it was a sad loss for the farm, it was such an important wildlife interaction to witness. Seeing this first hand, brought to light the challenges facing farmers in areas where they are trying to co-exist with important apex predators. Predation of livestock by a wild cat is a monetary loss for a farmer that could mean not being able to provide food for the family. 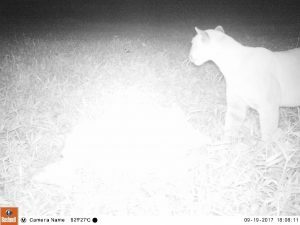 This challenge of farming alongside apex predators in a rainforest system is not only found in Costa Rica, but globally. Unfortunately, this type of human-wildlife conflict can often result in the killing of these apex predators to protect one’s farm. Osa Conservations strives to build a balance between healthy ecological systems with sustainable practices. Our wildlife-friendly farm offers opportunities to see not only how to grow sustainably, but also within the context of the greater ecosystem through agroforestry and rewilding. Yet, as we can see, farming alongside apex predators is no easy feat. As we continue to use the farm, we look for opportunities to better understand these challenges and to find solutions for tropical farming.